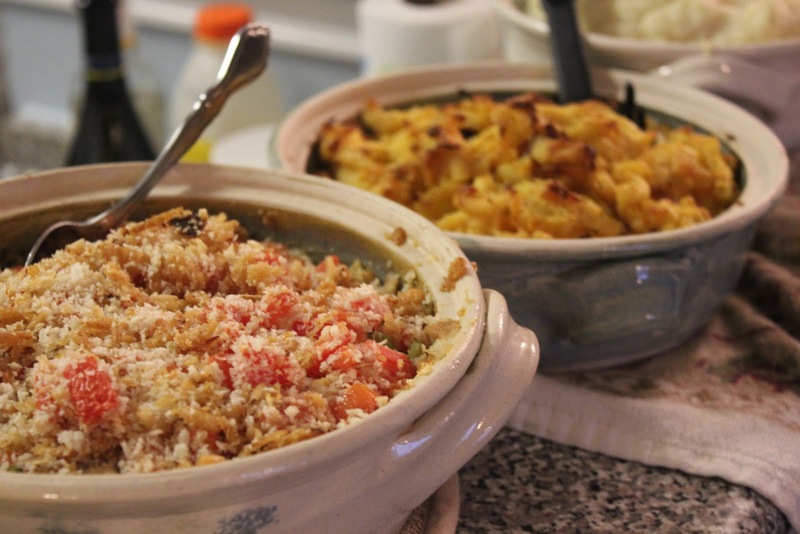 Can you handle one more (belated) Thanksgiving recipe? Please just say yes. This recipe has somehow been sitting on the back burner (no pun intended) since I made it on Thanksgiving day, but that’s not to say it deserved to be put there. Flipping through Southern Living searching for T-day recipes, this one immediately caught my eye. The heading read, “Irresistible Side.” Well, ok then. If you say so. I was looking for something with a pop of color for the meal, since most everything else is brown or white: turkey, potatoes, corn pudding, etc. Although the toppings of french fried onions and bread crumbs don’t help my argument here, the fresh green beans and tomatoes brightened it up perfectly. I had never made a green bean casserole before, and to tell you the truth I don’t even remember if I have tried anyone else’s. At a meal like Thanksgiving, it can be easy to pass up the healthier veggies for all of the other dishes. But this year was different. This is one recipe that shouldn’t be saved just for the holidays. 1. Preheat oven to 350 degrees. Bring water to a boil in a medium pot. Add beans and cook about 5-6 minutes. Drain and rinse in cold water. 2. In a large, deep skillet, heat butter until melted. Whisk in flour and continue to mix for about a minute. Slowly whisk in the milk and cook 3-4 more minutes. Remove skillet from heat and whisk in buttermilk and next 4 ingredients. 3. In another skillet, saute mushrooms over medium-high heat until lightly browned. 4. Add mushrooms and cooled green beans to sauce mixture in the deep skillet. 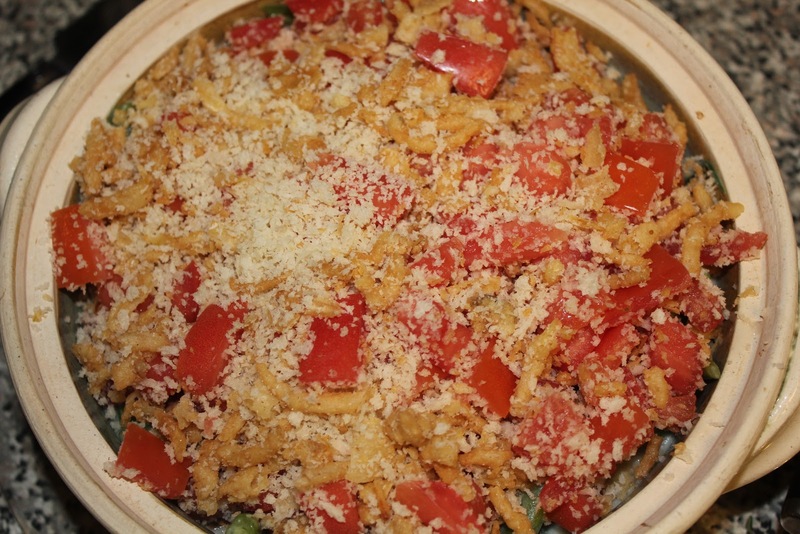 Toss all ingredients, then pour into casserole dish. 5. 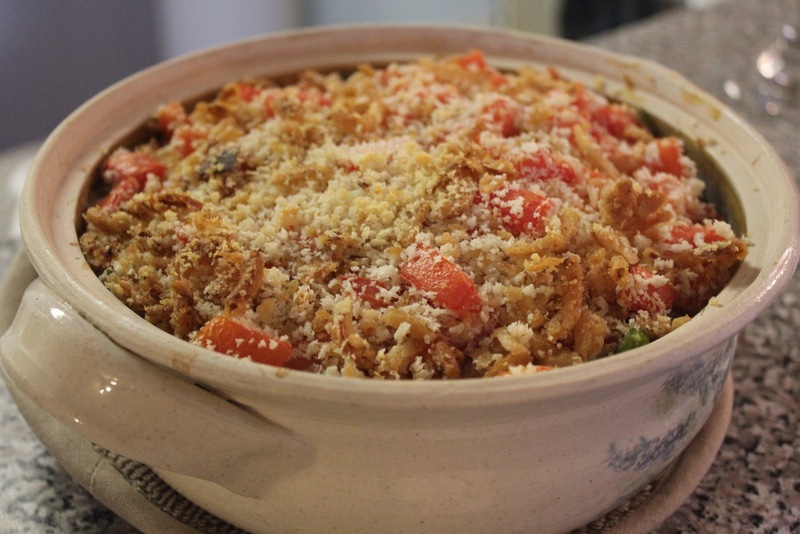 In a small bowl, combine french fried onions, breadcrumbs and tomato. Sprinkle over top of the green bean and mushroom mixture. 6. Bake for 30-35 minutes. Remove from heat and serve immediately.